As the weather gets colder, so the challenges for our skin start stacking up. Frosty mornings, central heating and late nights can easily lead to stressed, dull skin that has lost its glow. What to do about this seasonal dilemma? 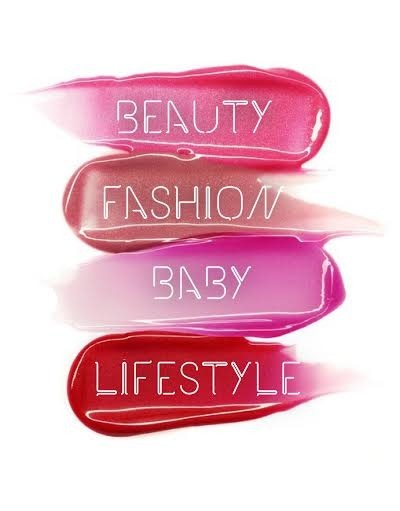 Well, there is a beauty solution out there that I always turn to and that is a good oil. Oils are a multi-tasking wonder product and one of the first things I turn to when I need to give my skin or my hair an extra boost. They can smoothe, calm and add lustre easily. And despite sounding counter intuitive, if you suffer from oily skin, they can be exactly what you need. Oils have become much more popular in the last couple of years and you can find a lot of products using them, but it can be hard to know exactly how pure the oil you're getting is. Plenty of products use a small percentage of natural oils and then pump mineral oils in as a cheap filler. These can clog pores and harm skin. The best way to start is to source an oil that you know is 100% natural and won't play havoc with the balance of your skin. 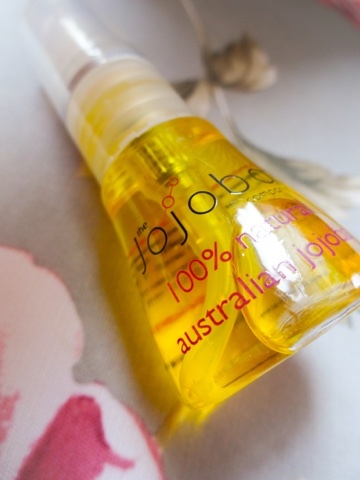 Recently, I've been testing out natural Australian jojoba to bring back my missing glow. 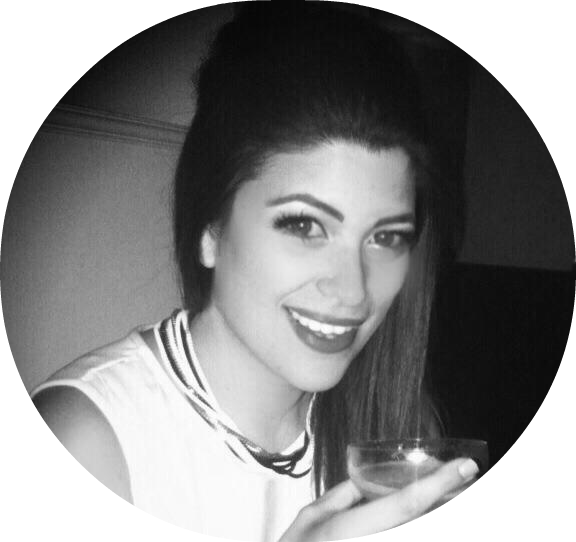 After having Theo my skin is drier and more depleted, so I feel like it needs some extra TLC. The texture of the oil is light and silky. If you have any lingering concerns about oils making your skin greasy, you don't have to worry with this. It sinks in instantly and doesn't leave any kind of residue sitting on the skin- this is a big advantage to using an all-natural product. Just a couple of drops is enough to leave my skin feeling silky and hydrated. I know a lot of people are allergic to (or just plain dislike) heavily perfumed products and this doesn't smell of anything much other than a very faint, nutty kind of aroma. So it's not going to compete with your perfume! At night, I've been popping this on after my serum and I've noticed that my skin feels really restored in the morning. I also add a drop to my usual face cream if my skin feels in need of some extra care and foundation just glides on afterwards. I mentioned acne and oily skin above. Natural jojoba can help with this, as the problem is caused by an over-production of sebum (basically skin trying to counter dryness), and using an oil can help to balance this and stop skin freaking out. Especially when you're using a pure formula. Jojoba oil contains an antiviral fatty acid that kills acne bacteria and can even help cure cold sores. But it's not just moisturiser that jojoba oil can work as. I've also been using it as a heavy duty make up remover. If you've done a smoky eye or gone to town with the contouring, it can sometimes feel that a million makeup removing wipes just aren't shifting the war paint, and they can dry skin out. A couple of pumps of jojoba oil melts away makeup and sticky stuff from the face. And after you rinse it off skin is nice and conditioned as well. It doesn't stop there. You can also use your jojoba oil for a cuticle oil, hair serum, lip balm, scalp massager, treatment for flaky hands and feet and as a 'carrier' for aromatherapy oils to create your own custom blend. 100% Natural Australian Jojoba is cold pressed to keep it as pure as possible, which makes it more effective. It's so pure a product that it can be great for treating conditions like psoriasis, eczema, dermatitis and rosacea. It also tackles fine lines and uneven pigmentation for those of us with concerns about skin aging (and since turning 30 this year that's top of my list!). It works so well because jojoba plant wax is almost identical in its composition to skin's natural sebum, so it can penetrate deep into the dermis. As this oil is completely natural it's also safe to use on babies. Theo was two weeks overdue so he arrived very dry-skinned. As you might know, you're not supposed to use products like Baby Oil on a newborn- their skin is extremely delicate and can react badly to chemicals. Because this is so pure, I've been able to dab some on to treat his dry skin and nappy rash, and it's worked beautifully. It's naturally crammed with antioxidants (that fight environmental damage to skin), Omega 6 and 9 fatty acids, and Vitamins A, D and E.
I'm amazed that one product can do so much and all with being completely natural, no parabens, chemicals, sulphates, fragrances and no harm to animals. It seems Mother Nature really does know best sometimes! I wouldn't be without this product now as it does so much, so effectively. 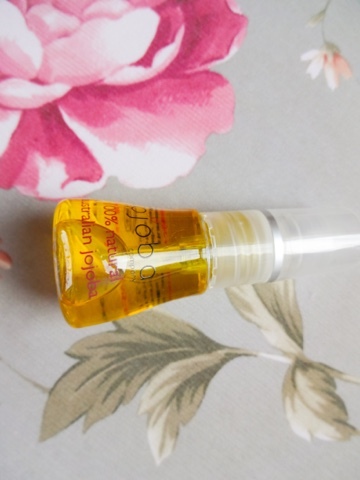 So, is it time to introduce natural jojoba oil into your life?